In other words, I did not use any commercial product to moisturize and style my hair. I am so tired of combining too many products to achieve a style. Besides, I am just so ready to keep things very easy. I am getting to know my hair and realizing that less is more for my hair. First, I washed my hair with Terrensential Mud Wash. 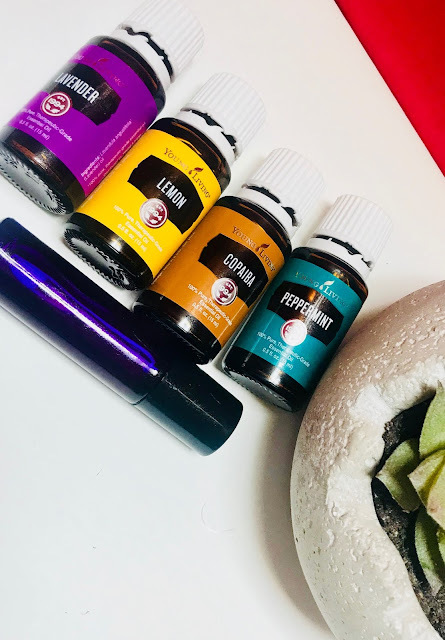 This draws oil, dirt and any other type of impurities from your hair. Review coming soon. Then I applied Shea butter mix, which is Shea butter mixed with oils. This was applied to 5 sections of hair while my hair was wet. 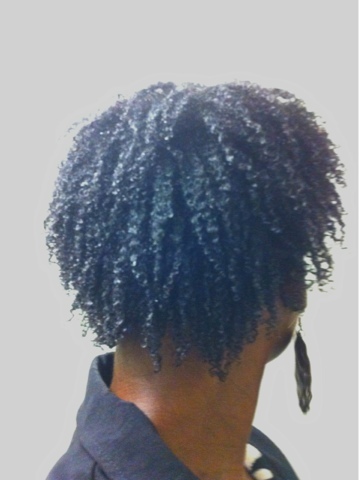 Once my hair was 90% dry in 5 twists, I applied my Home-made Flax seed gel which was mixed with Aloe Vera gel to bring the pH down. I did a 1:1 ratio of flax seed and aloe Vera gel. I then let my hair air/dry. Within two hours, my hair was ready. I put on my Sue Maesta cap. I did not do any pineappling or stretching. There is absolutely no manipulation. The next day, I spray a mix of water and Aloe Vera juice to wake up my curls. The curls are as fresh as they were on day 1. If you noticed, no conditioner was used. 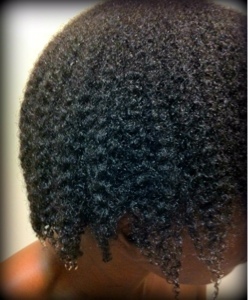 The Shea butter sealed moisture into my hair and kept my strands elongated. 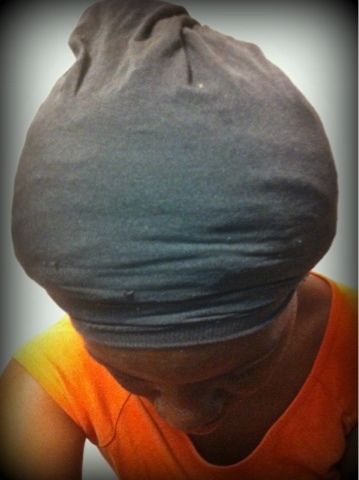 Shea butter helps stretch the hair. 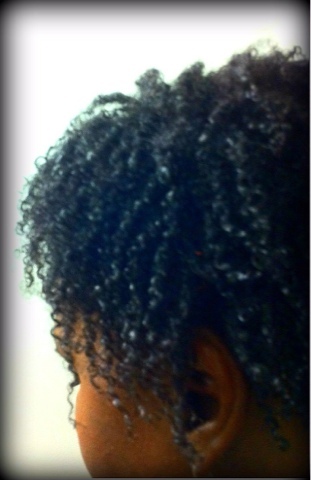 The flax seed helped enhance my curls and the aloe Vera gel helped elongate them, sealing the ends as well. I love this method and it is by far the best wash and go I have ever done. I did not have one single knot or breakage. My curls shrank but they were not as shrunken as they would with a conditioner. 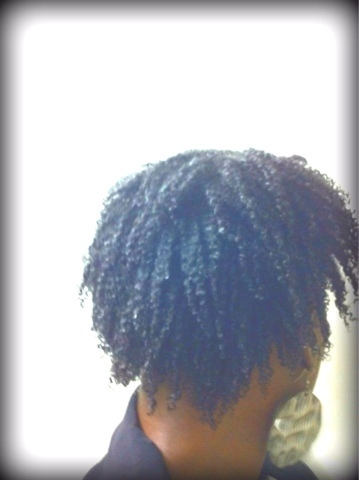 My hair was not crucnhy but the curls were firm and soft That is the way I have always wanted my hair to be with WnGs. Congratulations! Your hair looks great and another congratulations for breaking it down to the barest of minimums. Who needs conditioner with Terresentials! I'm glad you tried the Lavender Garden . . . that's the same one my daughter tried. I hope you like it! I mean really like it! What? I love it. I am glad that I don't have to use a commercial conditioner and my hair is doing great. I have noticed more body, probably because, I am not weighing it down with conditioner. LOL! I know sis... you will be tempted to buy it if you visited that site. But hey, I am pretty sure you will love the mud wash. It's so refreshing. - Literally.